With major projects on the horizon for Elon Musk, Tesla’s success is a great sign. Tesla recently announced in a press release that the company delivered approximately 24,500 vehicles in Q3. This is an increase of over 70% from last quarter’s 14,402 deliveries. While that jump is a huge win for Tesla’s stake in the electric vehicle market, it’s also a promising indicator to investors — particularly in light of long-term projects like the Gigafactory and a storied plan to colonize Mars. Tesla expects Q4 deliveries and production to be “at or slightly above Q3,” even though Q4 is a shorter quarter with holidays and potential winter weather delays. The increase is at least partially a result of Tesla reintroducing the Model S 60, which hits a lower price point that better suits wide consumer demand. The Model S 60 costs $66,000, and it features a 75kWh battery pack that extends the car’s power and range. Last quarter’s high numbers are especially promising in light of accidents related to Tesla’s autopilot feature earlier this year. While it was later established that the autopilot feature was not at fault for a fatal accident in Amsterdam, the potential for a negative public image could make widespread adoption of Tesla’s technology that much more difficult. Regarding public image, Musk recently made headlines for his announcement that SpaceX would plan to send humans to Mars as soon as 2024, if everything goes according to plan. While Tesla’s stock dropped after the big reveal (as it did back in July), last quarter’s numbers send a clear message: people are willing to put their trust (and money) behind the company and its enigmatic figurehead — particularly if they think that figurehead is trying to save humanity. 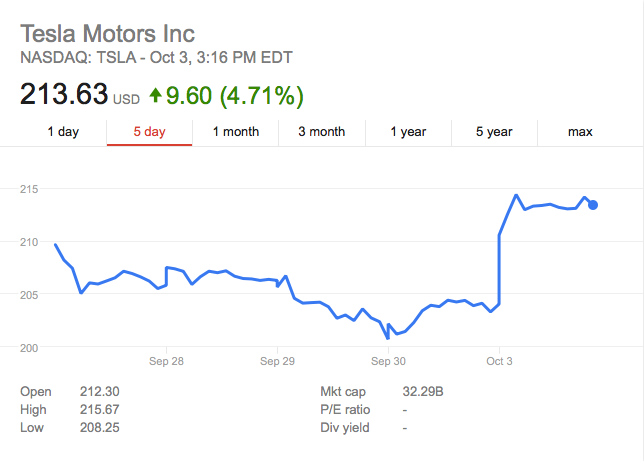 "Tesla delivered approximately 24,500 vehicles in Q3." With one in three people in Sub-Saharan Africa suffering from malnutrition, solar powered irrigation is a tangible solution.